On a certain Tuesday just before Spring Break, Andrew Hazuka started his day at Royal High School a little differently. With his straight-off-the-hanger light blue dress shirt and navy blue slacks, complete with patches, insignias and polished shoes, Andrew proudly wore his uniform for the first time. “They (the students) clapped when I came into class,” he said with a smile. Royal’s Air Force Junior Reserve Officer Training Corps (Jr. ROTC) program launched in August, and since then, Col. Mark Hustedt, the lead instructor, has battled patiently for the uniforms. On this day, he danced with excitement as he entered his third period class, known as Bravo Flight, and saw his 25 smartly dressed students. “Your uniforms make you look legitimate and, as we say, in regulation,” he told the class. The students’ delight in wearing their uniforms is just one more indication to how popular this program has become at Royal. Deborah Salgado, director of secondary education for the Simi Valley Unified School District, applied to the Air Force for the program when she was principal at Royal. Laurie Herman’s daughter, Alexa, is in the Bravo Flight class. She said that after watching her ninth-grader these past months, Herman loves this program because of what it teaches. Eleventh-grader Jasmin Grewal serves as cadet second lieutenant for Bravo Flight. She joined the Jr. ROTC because she wants to pursue a military career and is working toward her acceptance in the Air Force or Naval Academy after high school. On uniform day, Jasmin readily helps her fellow female cadets on the details of wearing the uniform correctly. “Your name tags need to be centered between the button and the shirt seam,” she said as she helped pin a tag in place. The other cadets said wearing the uniforms for the first time that day made them stand out, but no one teased them in a bad way over it. “Someone told me, ‘Don’t let anyone tell you differently. You look fabulous!’ And that helped a lot,” said Cadet Hayley Richardson. 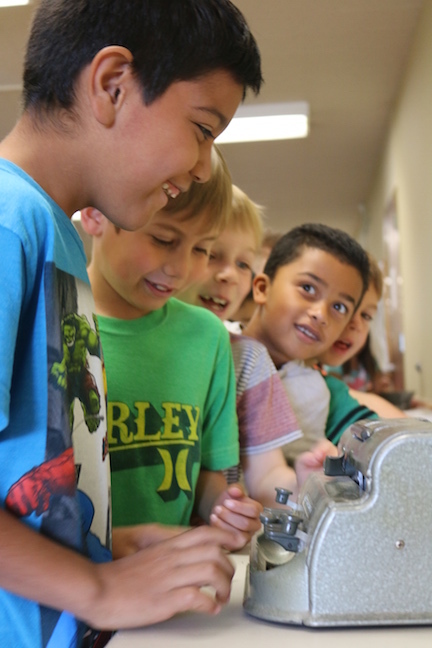 First graders at Garden Grove Elementary try out the Braille machine. Braille is a system of raised dots on paper that enable the visually impaired to read books. The second and third graders sitting in Andrea Keller’s classroom are learning a little differently this day. Three sound systems positioned around the room are each blaring different lectures or music. Throughout this cacophony of sound, the students are asked to work their way individually through a timed reading comprehension lesson. Most are not successful and many are frustrated by their own lack of concentration. This short moment was used by Keller in last month’s Abilities Day at Simi Valley’s Garden Grove Elementary School to show these students how other students with learning disabilities struggle in class. Principal Martha Feinstein said this all-day event happens each year. “We do it because we mainstream kids at every opportunity,” she said, referring to Special Education children who attend Garden Grove. Mainstreaming means that wherever and whenever possible, Special Education children attend classes with their non-assisted peers. “It gives students a little more awareness of what goes on for some students,” she said. It’s difficult for these students to concentrate with the chaotic noise playing in the background. This mimics what some students with learning disabilities may experience every day in class. In another classroom, students are shown how visually impaired peers are taught, using Braille and hands-on learning tools. Soft books with lots of texture and cut-out boards with fitted shapes help small hands identify shapes and materials in the absence of sight. Students in the outside lunch area are learning basic American Sign Language words to communicate. And on the kindergarten play area, fifth graders learn about physical therapy. They get to try-out a wheelchair, crutches and other equipment used to enable mobility. Every student rotates throughout the day to different classrooms focused on a specific medical need. By the day’s end, there’s a lot of understanding accomplished, Feinstein said. 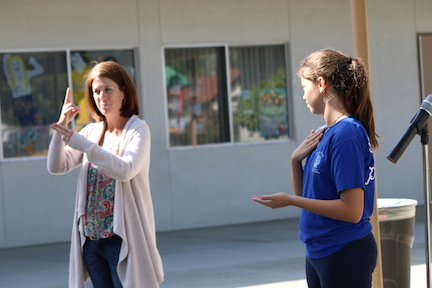 American Sign Language teacher Diana Eschenbach shows sixth graders how to sign their names. “There’s a lot of empathy here already, but there’s always more after,” she said. This year is a special year at Simi Valley’s Township Elementary School as it celebrates its 50th anniversary. And what better way to celebrate a milestone anniversary than with a time capsule? Then tie this event into curriculum, and we’ve got a perfect Common Core lesson. This year, student teacher Linsey Jassem has worked with Martha Nissen’s 4th and 5th graders to help them learn about timelines and how events develop over time. As part of a Scholastic News article, Jassem decided to have the students bring items to create a time capsule for the campus. Students brought in menus, small toys, a 2015 penny and other small items commonly used. 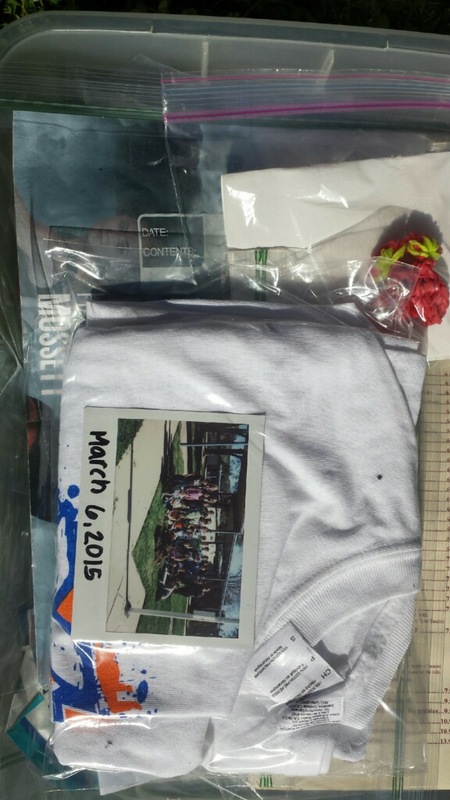 The PTA even donated a Township shirt and all the students wrote notes to whoever opens the capsule. 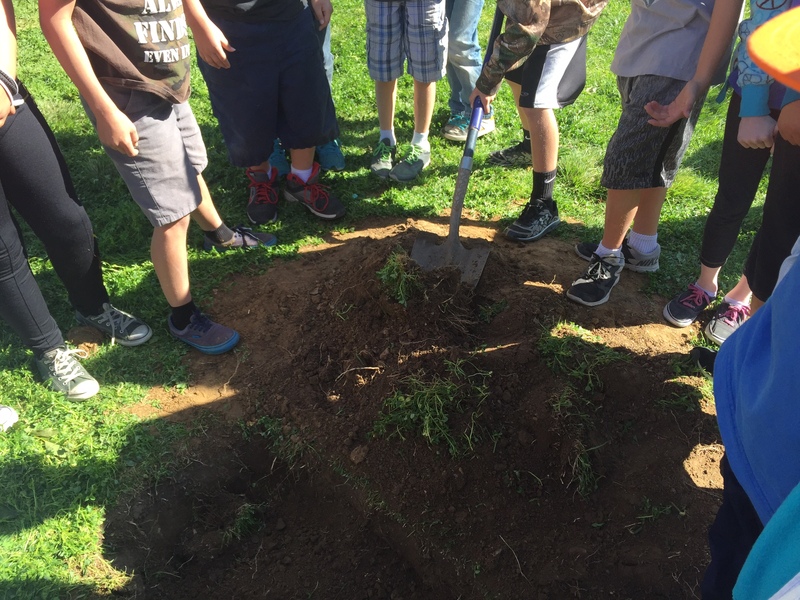 After wrapping everything carefully and sealing the box well, a district landscaper dug a hole just the right size near the front of the school. A class picture was taken and placed in the box. Then it was time for the students to wave good-bye to their treasures! Back in the classroom, the students predicted what people will think when the box is opened in 50 years. They will also work on creating a map to remind future employees that something special is buried on the campus. One poster for the new First Wives Club features Tessa Grady. 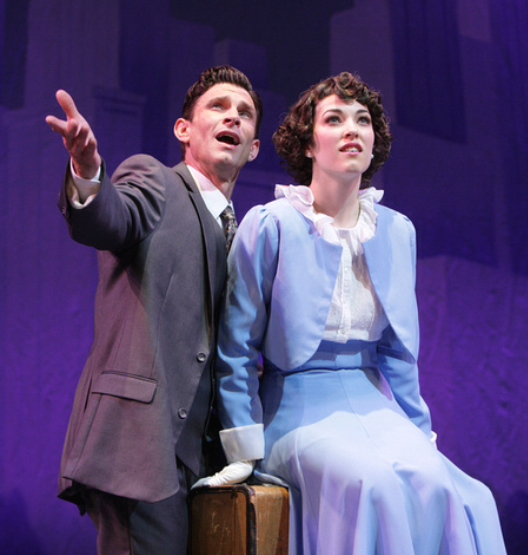 Tessa Grady makes her living singing and dancing on Broadway stages. Her life is the dream of so many young performers. And while she had a strong foundation in her trade, performing in regional theater groups, like the Cabrillo Music Theatre, it wasn’t until the 21-year-old found her way back into the classrooms at Santa Susana High School in Simi Valley that she developed a wider range of skills that makes her more marketable for producers today. “The teachers told me you’re going to do everything differently,” Tessa said. “They stretched me. I said, ‘I’m an alto.’ Mrs. (Bevin) Abbe said, ‘You’re going to be a soprano.’ I thank her every day because I’ve played multiple roles as a soprano, and I never thought I could have that range. 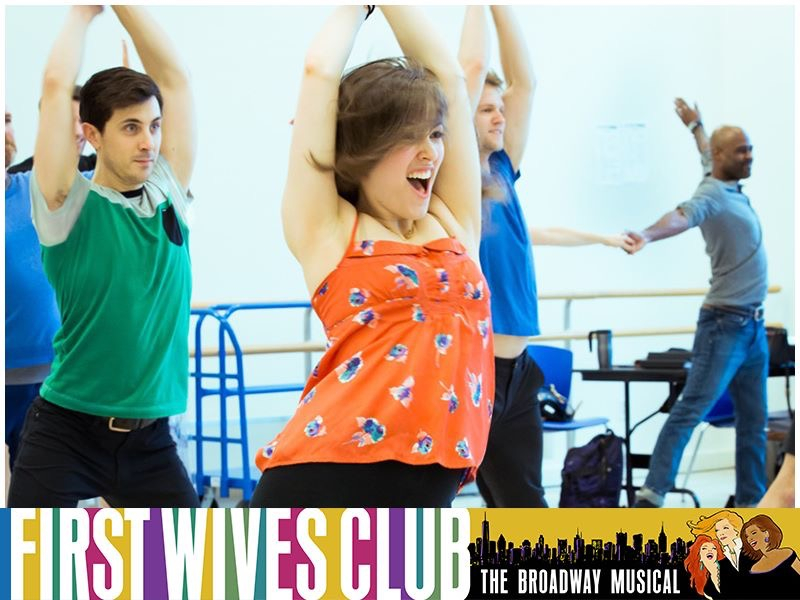 Tessa, now based in New York City, but currently working in Chicago in a new musical, First Wives Club, had been mostly homeschooled until high school. Her mom, Ginny Grady, knew that her extraverted daughter needed more people around her. “I did my best to keep her socialized, but I saw that she needed a bigger pond to swim in,” she said. Living in the Conejo Valley, Ginny Grady discovered Santa Susana High School and thought that between the school’s performing arts focus, small size and strong reputation for excellence, it was the perfect fit for her daughter. 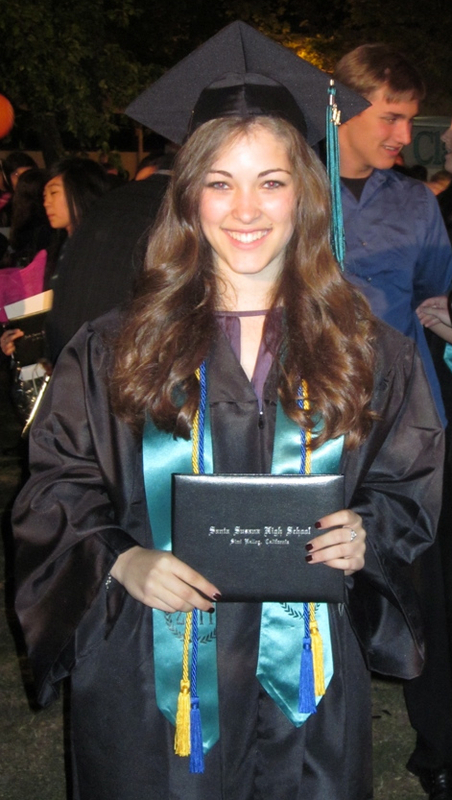 “Santa Susana is an amazing school and it was the perfect transition for Tessa,” she said. Tessa Grady in Annie on Broadway. Tessa comes by her talent naturally. Her mother still works in theater, and has helped produce and direct shows at Cabrillo and even Santa Susana, after Tessa graduated. Tessa’s father, Don Grady, was a child actor who played the role of Robbie on My Three Sons. He went on to become a Mousketeer for the Mickey Mouse Club and stayed in the industry working, on the music side, until his death from cancer in 2012. Ginny Grady said her husband wasn’t keen on Tessa’s theater ambitions and wouldn’t allow her to have an agent until she was 16. So Tessa honed her skills locally and at school until she graduated. Then, with her parent’s blessing, she gave herself one year to work before she would apply to college. She decided to keep performing until she wasn’t getting any work. That has yet to happen. Instead, she received a call about two years ago for an audition in New York for Mama Mia! Of course she would go, she told her agent. She always wanted to live in New York. But just as she was leaving, another call came in saying that the producers of Annie were very interested and could she audition for them? Annie, on Broadway! That was her dream. She auditioned and they hired her almost immediately. Her role was the aspiring actress who walks through the stage singing while Annie and Daddy Warbucks are touring the city, a short but very sweet solo for this first time Broadway performer. Annie folded about six months later and Tessa went on to land a role in the ensemble of Cinderella. She also served as the understudy to Cinderella. Did she ever get to fill in for the star? “They kept bringing in celebrities to be Cinderella. And they were never there long enough to get sick so I could take over,” she said. Still, it was an amazing show to work on. It, too, closed about six months later, but Tessa was able to land more roles, never being out of work for long. The hope now is that First Wives Club will take off in Chicago and work its way back to Broadway. Learning life skills are an important part of high school as well, and Tessa says that Santa Susana’s teachers didn’t short-change her on those either. 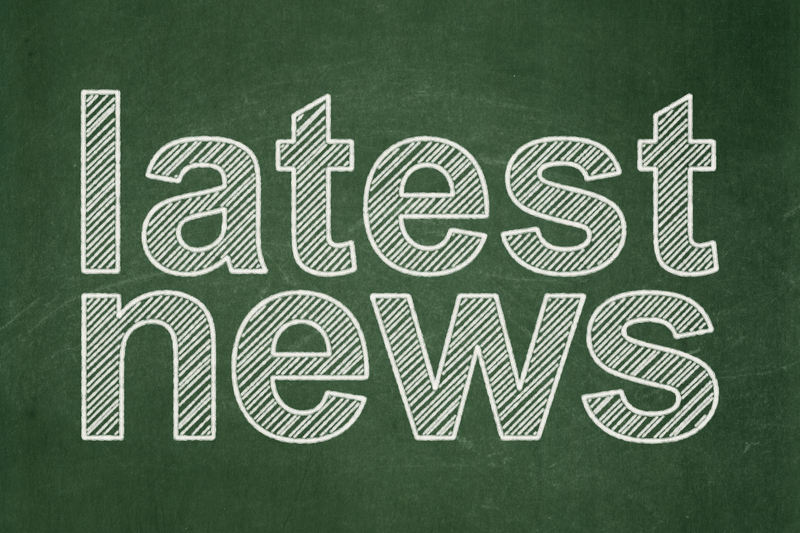 At a special board meeting tonight, the SVUSD Board of Trustees approved and announced some management changes beginning in the 2015-2016 school year. Dr. Stephen Pietrolungo, current principal of Simi Valley High School, will take on the position of principal at Monte Vista School. 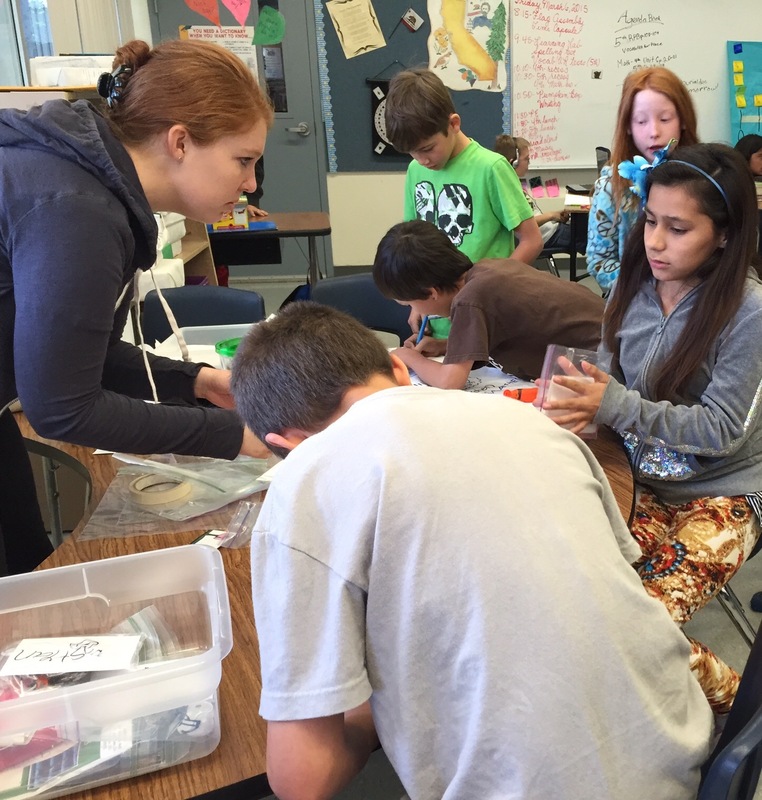 Monte Vista is the district’s independent study/homeschool program and it has seen steady enrollment growth over the last several years as some families seek more flexible education options while still following state curricular guidelines. Board President Dan White called Dr. Pietrolungo’s appointment “exciting,” and said that the growth of Monte Vista’s programs was a big part of the district’s overall strategy for growth in the future. 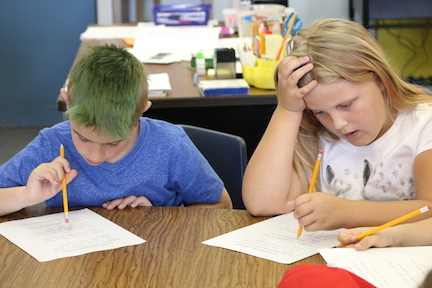 By expanding the independent study programs offered through Monte Vista, the district hopes to see more increased enrollment. Currently the school is led by Dean May, who is also the principal of Apollo High School. May will remain as Apollo principal. Plans are also in place to relocated Monte Vista to the Abraham Lincoln Elementary School campus next year. Dr. Terri Leon, the current assistant principal at Royal High School, will be moved to Valley View Middle School as assistant principal. Under Deborah Salgado’s leadership at Royal, Dr. Leon oversaw the application and approval of Royal’s new International Baccalaureate Diploma School designation. Patti Myszkowski, the current assistant principal at Hillside Middle School, will assume Dr. Leon’s place at Royal. Nicole Perryman, the current principal of Abraham Lincoln Elementary School (which will be closing at the end of this school year) will become dean at Sinaloa Middle School. Dr. Jason Messinger, current dean, will be reassigned to a classroom next year at a school as yet to be determined. Stacy Walker, the current principal at Justin Elementary (which will be closing at the end of this school year) will be reassigned to a classroom next year at a school as yet to be determined. Your teen son tells you he’s spending the night at a friend’s house. He doesn’t tell you the friend’s parents aren’t home. Or that there’s a big party planned there that night. Or, worst of all, that there will be a lot of alcohol–and probably drugs–circulating at this party. It’s possible he doesn’t even know all of this himself. And because you trust your son (and this could just as easily be your teen daughter), off he goes. As parents, do we really have a clear understanding of what today’s dangers are with teen drinking and drugging? We know the overall scenario–drugs are bad, teens aren’t allowed to drink, and more. But modern partying among teens has far more complicated aspects to it that in decades past. 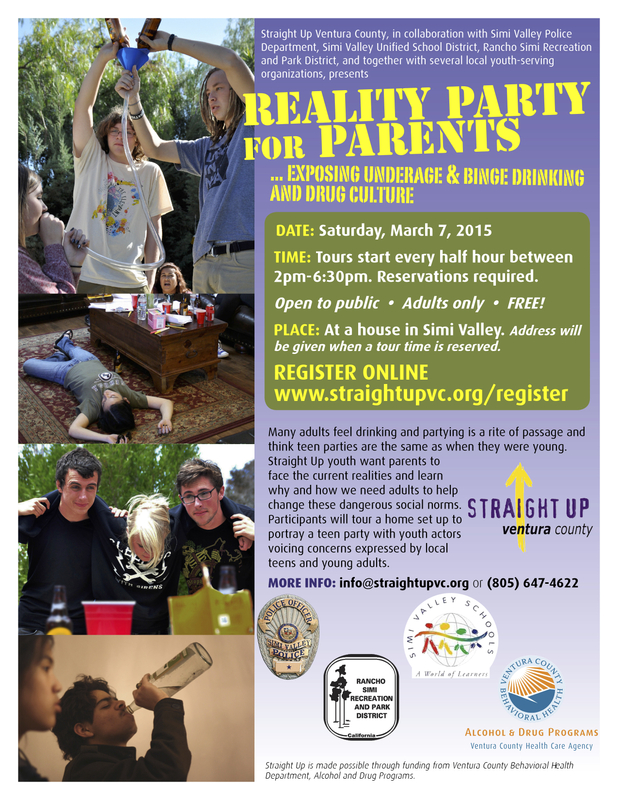 On Saturday, March 7, Straight Up Ventura County will host its annual Reality Party for Parents in Simi Valley. Straight Up is a youth development organization that works with kids ages 12 to 25 to promote social change through improvisation and interaction with other youth and concerned adults. Straight Up says this about the Reality Party for Parents: Many adults feel drinking and drug use is a rite of passage and think teen parties are the same as when they were young. Straight Up youth want parents to face the current realities and learn why and how we need adults to help change these dangerous social norms in Ventura County. To do this, the Straight Up teens create a typical party and act out scenes commonly found at a teen party. Parents “tour” the home and watch scene after scene of what often plays out at a teen party involving drugs and alcohol. After, a panel of teens, educators and public health officials facilitate a question and answer session to offer information and foster greater communication. Each tour and discussion lasts about an hour and is free, but reservations are required. The tours are staggered between 2 and 6 p.m. and there are seven tours altogether. To register, go to this LINK. Because the tours happen at a private home in Simi Valley, space is limited and the address will be released only after registration is complete. And for those who do attend this event, we’d love to hear your thoughts after. Please feel free to post comments on this blog about your experience. Did you know that you can receive all of our Simi Valley Schools updates in your email inbox? Simply sign up on the upper right hand corner of this page for email notifications and that’s it. Also, we’re on Facebook and Twitter. Click on the icons and they will take you directly to our social media pages. 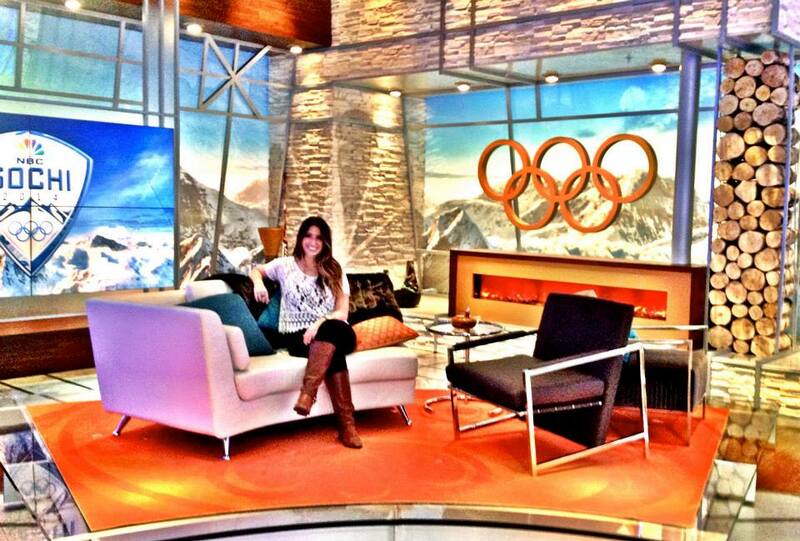 Emilie Mateu on the NBC set of the 2014 Winter Olympics In Sochi. Mateu is a 2009 graduate of Royal High School in Simi Valley. She also attended Sinaloa Middle School and Wood Ranch Elementary School. She knew she loved to write and tell stories, but Emilie Mateu did not know that she was destined for a life of journalism while she attended Royal High School. Still, Mateu, 23, credits the lessons learned there in leadership and academic excellence to guiding her into a prestigious university where a love of journalism was born and a satisfying career in broadcast journalism at NBC Sports was discovered. “Somehow I got lucky,” Mateu said. 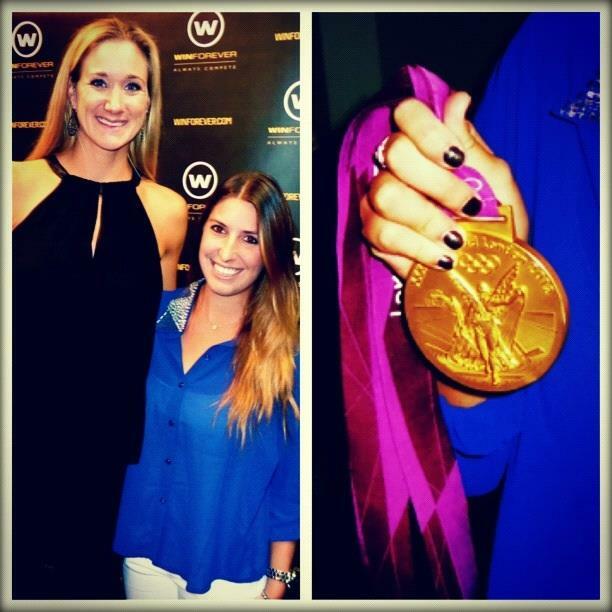 Emilie Mateu stands with Kerri Walsh Jennings, the three-time gold medalist in Women’s Beach Volleyball. This picture was taken during the 2012 Summer Olympics in London. Mateu and her family moved to Simi Valley when she was in the sixth grade. She attended Wood Ranch Elementary School, Sinaloa Middle School and Royal, where she graduated from in 2009. When she went on to the University of Southern California, Mateu said she quickly knew that she was equal to, if not above, her peers in terms of her academic preparedness for this elite university. Besides loading up with AP classes, Mateu became involved in student government and leadership activities at Royal. She also ran cross country track. 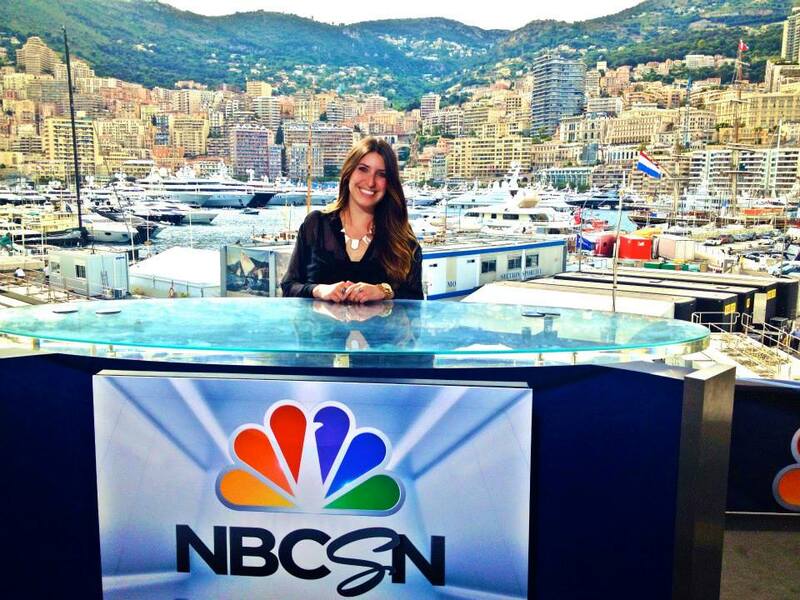 With the beautiful country of Monaco behind her, Emilie Mateu sits in the NBC studio during the Monaco Grand Prix races in 2014. At USC, she quickly found journalism to be a natural fit for her talents. In her junior year, she applied for an internship to work at the 2012 Summer Olympics in London. The NBC producer she worked with there hired her after graduation and now Mateu lives in New York City and works in the Connecticut office of NBC Sports & Olympics. Her main job is to help develop the long-form documentaries and features on the athletes at the Olympics, those behind-the-scenes profiles aired throughout the games on interesting athletes. “I do all behind-the-scenes. I’m a part of the production group that is putting everything together, going on shoots, organizing footage,” she said. But in between the Olympics, which happen every two years, Mateu works on other major sports events. “They have us rotating around on other sports, helping on other parts of the company. I was working on Formula 1 car racing for a while and the Tour de France this summer,” she said. Earlier this month found Mateu in Glendale, Arizona, where she helped develop stories for Cris Collinsworth’s game coverage. 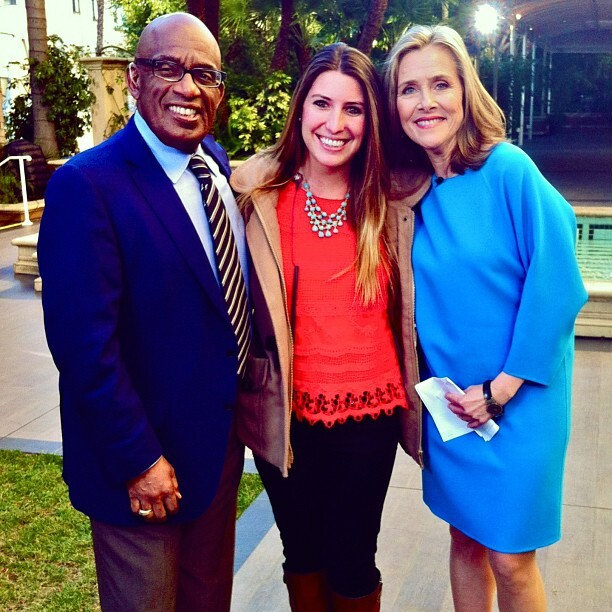 Emilie Mateu stands with Al Roker and Meredith Vieira of the Today Show. She met them both while interning at NBC during her junior year at USC. Mateu’s parents, Julie and Mickey, still live in Simi. Her younger sister, Sophie, (also a Royal grad) attends Brown University and is studying abroad this year in South Africa. About her experience in Simi Valley’s schools, Mateu said she only has the highest praise to offer. When asked what she might advise other students as they work their way through school, she said to actively try hard and be nice. Did you know that you can receive all of our Simi Valley Schools updates in your email inbox? Simply sign up on the upper right hand corner of the home page for email notifications and that’s it. Also, we’re on Facebook and Twitter. Click on the icons and they will take you directly to our social media pages.